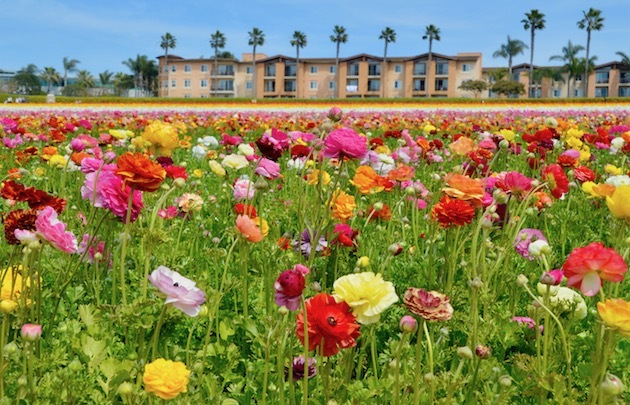 There are no words to describe the beauty of The Flower Fields in Carlsbad! 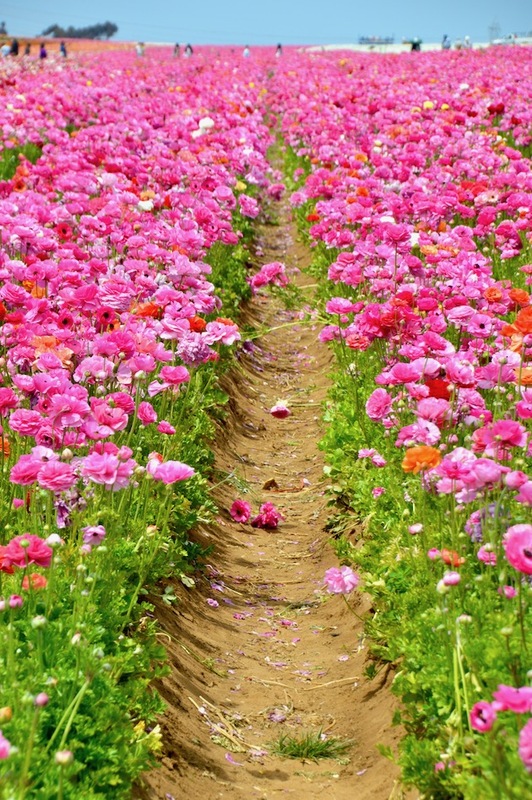 It's definitely like you've died and gone to heaven...flower heaven! 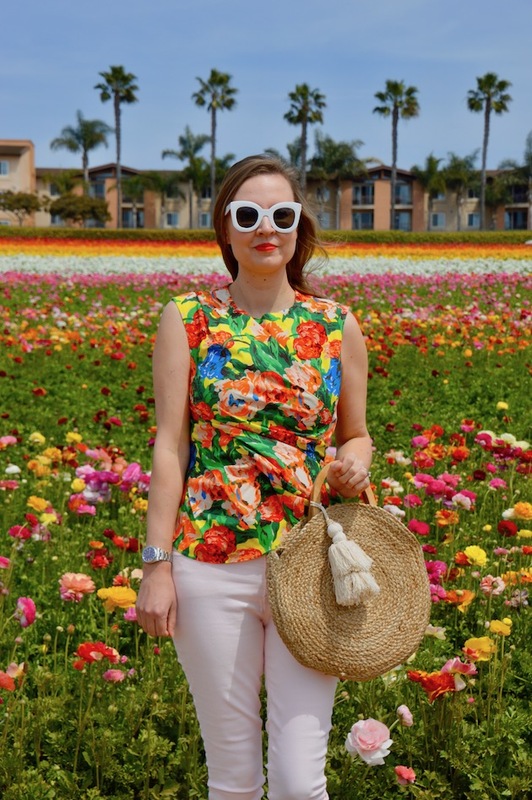 If you're in the San Diego area, I would highly recommend visiting this scenic destination, as it's perfect for anyone who loves flowers or just bold swaths of color, such as myself. Although my husband wasn't thrilled about paying the $16 entrance fee to get in (he said one could see most of it for free from the road, parking lot, or from the nearby outlet mall!) I think maybe he secretly enjoyed it too! 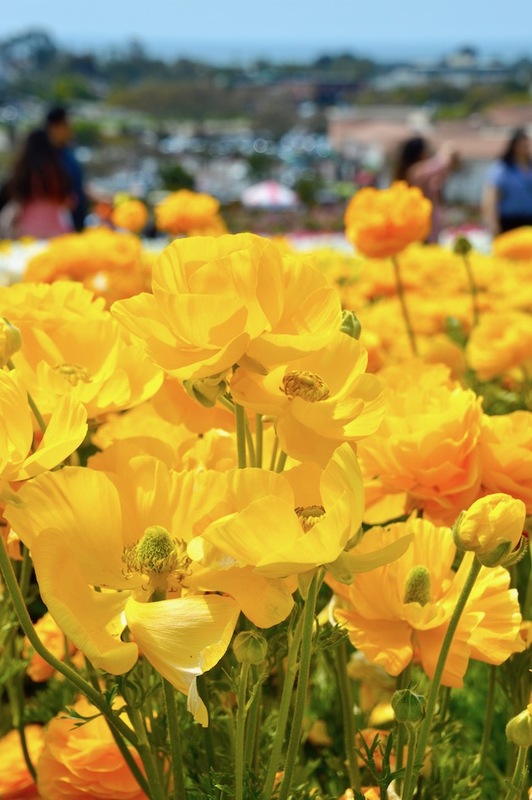 As I mentioned above, if you're interested in visiting The Flower Fields, you will have to pay an entrance fee and possibly deal with crowds, which I was not expecting. The crowds were particularly surprising given the fact that we visited on a Tuesday. I would hate to see this place on a weekend, as it's probably just swarming with people! Another heads up is that it's quite windy as the fields are near the ocean. Next time around I would bring a hat, although the hat would have probably just blown off of my head! 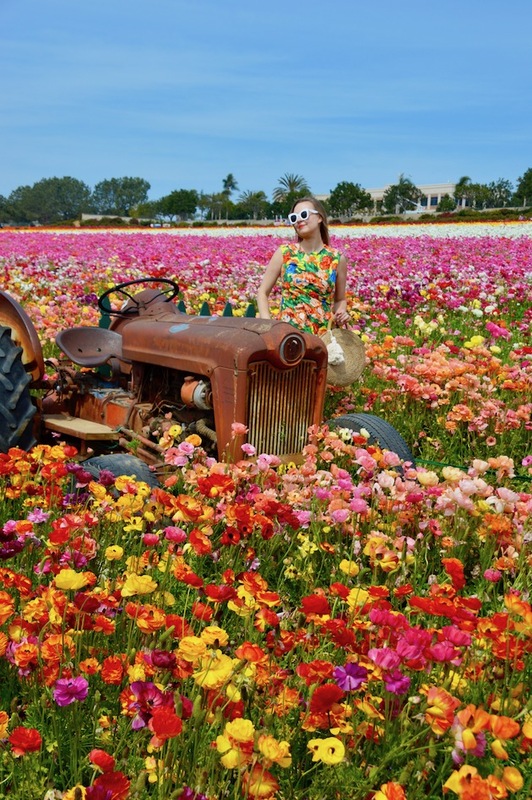 Another tip I have regarding visiting The Flower Fields is that you should check to make sure the fields are at their peak before making the trek there. 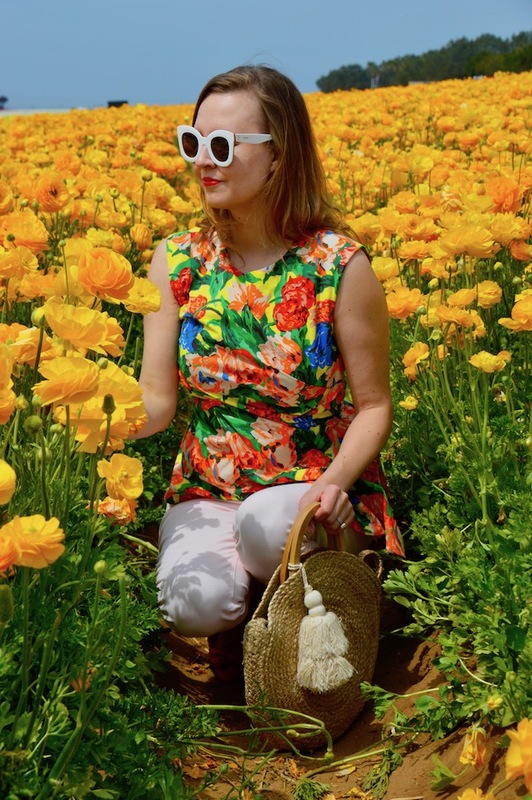 A few weeks ago we had some pretty heavy rains in California that I think contributed to the vibrancy of the current crop of flowers in the fields. 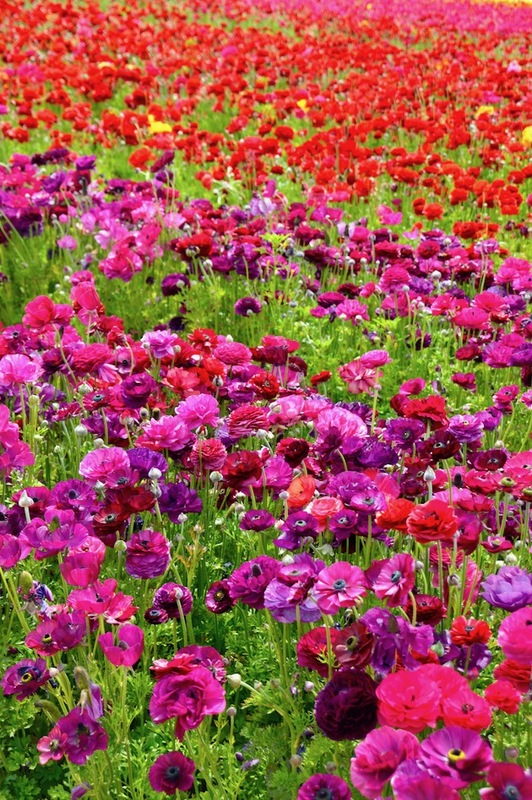 In fact, last week was apparently the peak time to visit to see the flowers in their prime. Luckily, this coincided with my spring break, so it all worked out just perfectly! 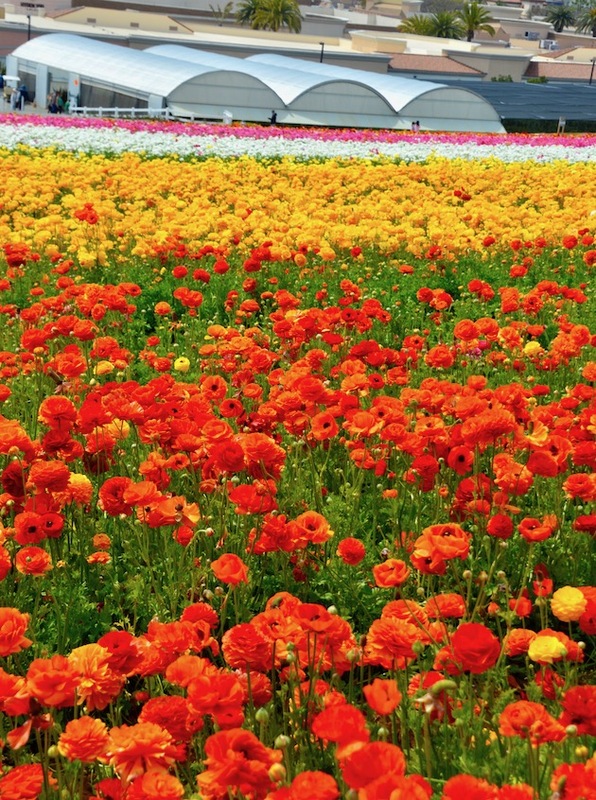 If you are interested in visiting the Flower Fields you also might want to follow them on Instagram to get updates on how the crop is doing and when peak bloom times are. Last of all, I must talk about my outfit. (This is a fashion blog after all!) 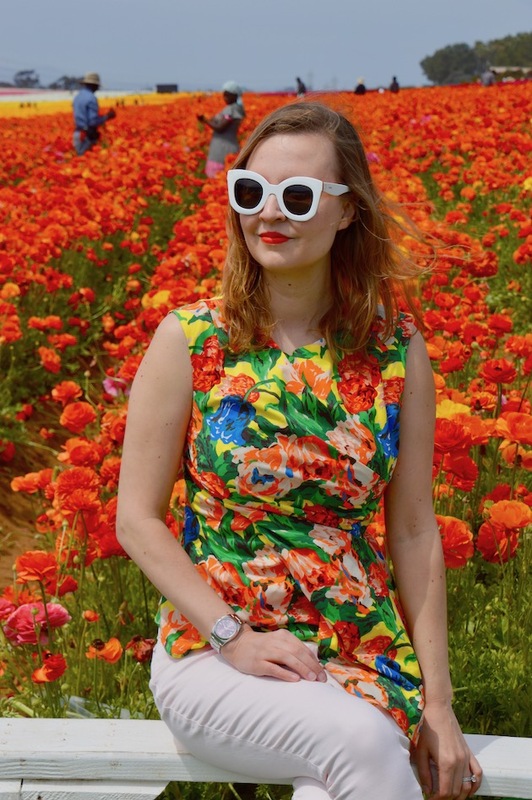 My floral blouse, which I picked up at a deeply discounted price during Zara's winter sale a few months ago, almost looks like it could be a photo or maybe a painting of the flowers in these fields. 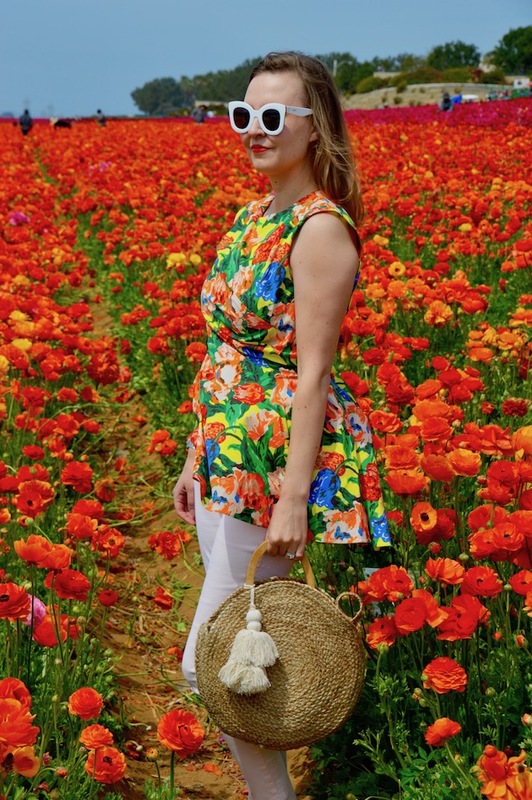 In fact, I like to call it "flower camo" because of how seamlessly it blends in with my surroundings! 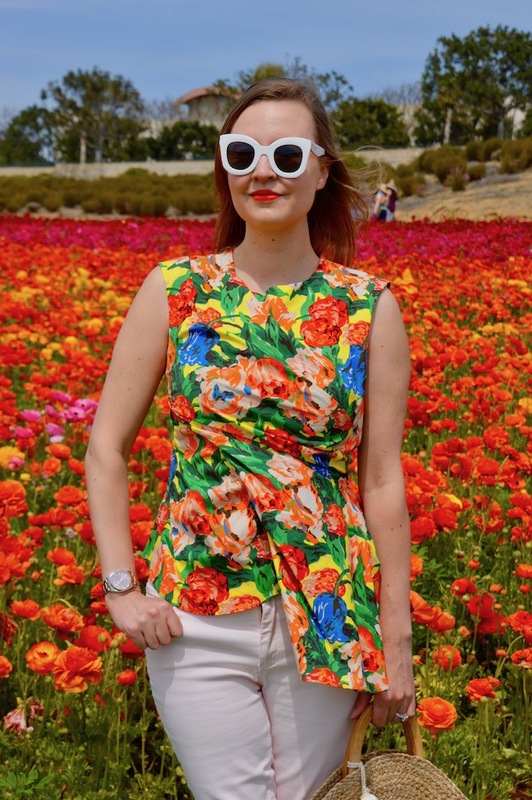 As you know, I like to dress for the occasion and I feel like this shirt was the perfect thing to wear to the most perfect of places! Wow! 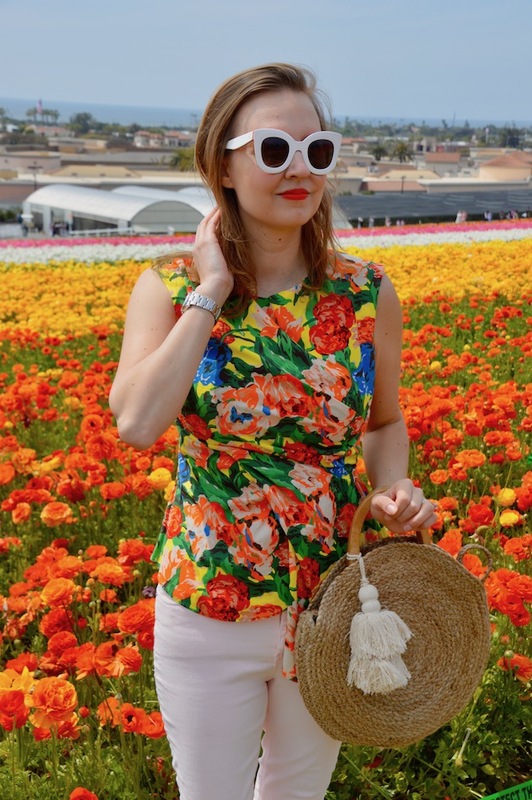 You look great in floral! WOW! so many types of flowers. 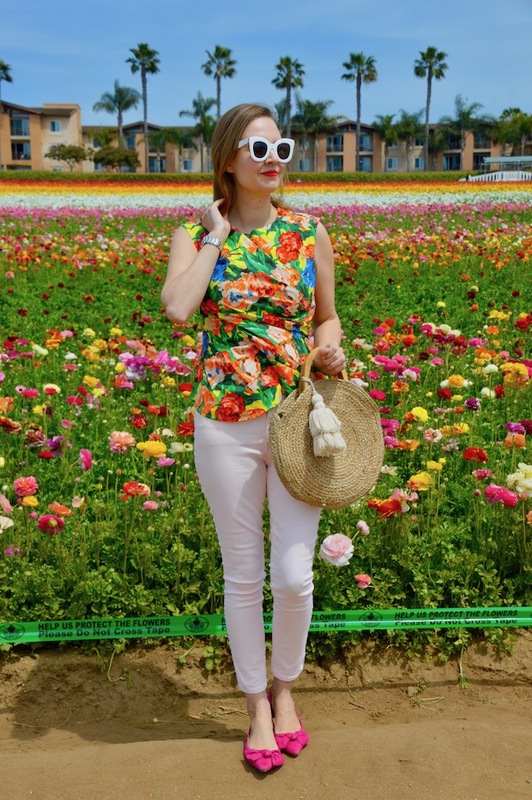 The flower fields are just wonderful and your pretty floral top was the perfect choice. 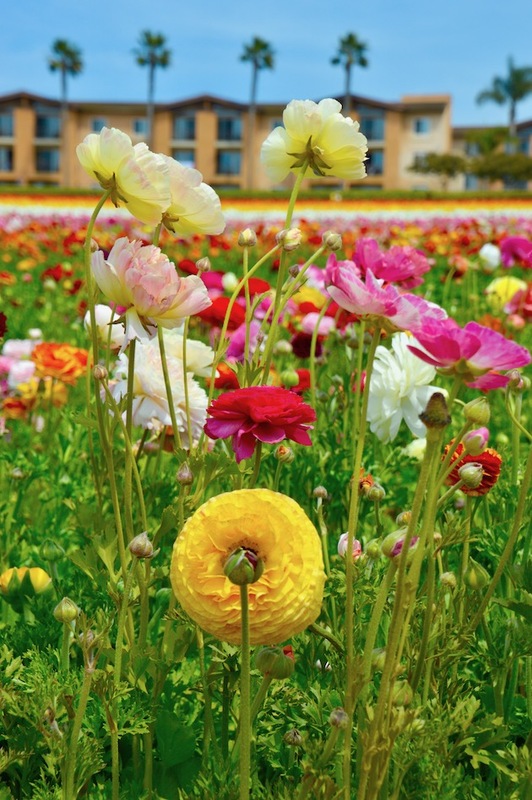 the flower fields are so amazing! 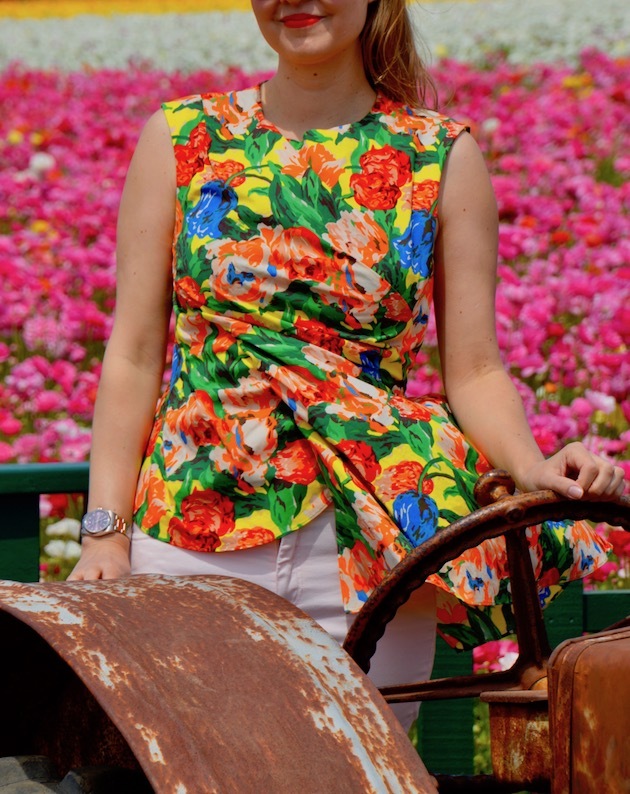 I love the top and you are right, it's definitely 'flower cammo'! My sister said she's going to try and get to the fields this weekend - I'm jealous! 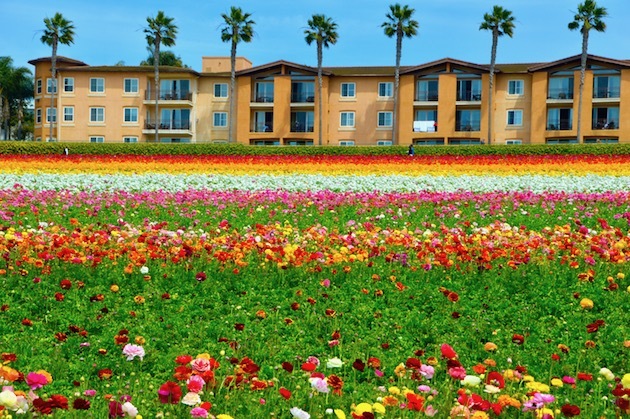 How beautiful are these fields?! Love your top, you look simply amazing! Wow! So beautiful! Love all of the gorgeous flowers, must have been a great day! You are dressed perfectly and blend in so well! I love the pink flats with all of the colors of your top.